The Philharmonia Orchestra is widely recognized as the UK’s finest orchestra with an impressive recording legacy. This fifth album with Signum combines the Philharmonia’s renowned sound with the leadership of Maestro Davis, whose recording and performing career spans all the great orchestras of the world. 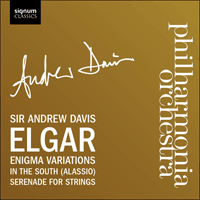 This album features Elgar’s best-known orchestral works: the 'Enigma' Variations depicting twelve of Elgar’s family and friends in fourteen variations, the Serenade for strings, and In the South, a Concert Overture written for the Elgar festival in 1904. After a long day’s fiddle teaching in Malvern, I came home very tired. Dinner being over, my dear wife said to me, ‘Edward, you look like a good cigar,’ and having lighted it, I sat down at the piano. In a little while, soothed and feeling rested, I began to play, and suddenly my wife interrupted by saying, ‘Edward, that’s a good tune.’ I awoke from the dream: ‘Eh! tune, what tune!’ and she said, ‘Play it again, I like that tune.’ I played and strummed, and played, and then she exclaimed, ‘That’s the tune.’ And that tune is the theme of the Variations. Since I’ve been back I have sketched a set of Variations (orkestry) on an original theme: the Variations have amused me, I’ve labelled ‘em with the nicknames of my particular friends—you are Nimrod. That is to say I’ve written the variations each one to represent the mood of the ‘party’—I’ve liked to imagine the ‘party’ writing the var[iation]: him (or her) self & have written what I think they wd have written—if they were asses enough to compose—it’s a quaint idee & the result is amusing those behind the scenes & won’t affect the hearer who ‘nose nuffin’. This type of exuberant writing is typical of Elgar and such japes and high jinks can be seen not only in the letters, but in the composer’s most basic musical sketch books right through to the completed score of a work. In the case of the ‘Enigma’ Variations and those ‘pictured within’, it took some years for all of the composer’s friends to be identified, helped by Elgar’s notes for pianola rolls made of the Variations around 1927. In all, twelve friends are depicted in the fourteen variations, Elgar’s wife and the composer himself acting as musical book-ends in the opening and closing variations, respectively. The famous G minor theme is built on short melodic fragments of four notes in length which supply the meat for the variations. This is followed by a contrasting, mellifluous melody in the woodwinds, leading into a reprise of the initial theme. Variation 1 (L’istesso tempo): C. A. E.
Caroline Alice Elgar, the composer’s wife. Suitably the recipient of the first variation, it was she who seemingly encouraged Elgar to repeat the Enigma theme when he was improvising at the piano in October 1899. Variation 2 (Allegro): H. D. S-P.
Hew David Steuart-Powell. A pianist of note enough to be Hubert Parry’s duet partner and a welcome member of chamber music evenings attended by the Elgars and others. His pianistic warm-up of running over the keys before playing is here mimicked in a manner the composer thought beyond Steuart-Powell’s capabilities. Variation 3 (Allegretto): R. B. T.
Richard Baxter Townsend. A wide traveller, gold prospector, Native American sympathiser, Classics teacher, author, scholar and all-round eccentric, Townsend might have provided enough material for a complete set of variations on his own. Elgar’s take on him appears to be centred on a memory of a particular amateur theatrical event where Townsend’s voice flew from baritone to soprano, as if his voice had never properly broken. Variation 4 (Allegro di molto): W. M. B.
William Meath Baker. Country squire, sportsman and devoted Wagnerite. Apparently rather more a friend of Alice Elgar’s, the variation is described by Elgar as the host (Baker) reading out the arrangements for the guests’ horse-and-carriages for the day, before he ‘hurriedly left the music-room with an inadvertent bang on the door’. Variation 5 (Moderato): R. P. A.
Richard Penrose Arnold. Pianist and son of the poet Matthew Arnold. This variation portrays his serious demeanour which was shot through with whimsy and wit and a ‘funny little nervous laugh’. Isabel Fitton. The daughter of music-loving friends, Elgar taught her the violin and viola and dedicated a piano work, Presto, to her on her 21st Birthday. The variation includes a technical joke concerning an exercise for playing between the second and fourth strings of the viola, without hitting the third in error. Arthur Troyte Griffith. Architect, painter and stage designer, he was a life-long friend of the Elgars. The music caricatures his hopelessly chaotic, if enthusiastic piano playing, and Elgar’s frustrated attempts to ‘make something like order out of chaos’. Variation 8 (Allegretto): W. N.
Winifred Norbury. Friend, and co-secretary of the Worcestershire Philharmonic Society. The portrait extends beyond Winifred and her distinctive laugh to the 18th Century house in which the Norbury family lived—a building very much admired by Elgar. August J. Jaeger. Editor at Novello music publishers and great champion of Elgar’s music. Nimrod, the Biblical patriarch was a great hunter (and the English translation of the German name, Jaeger), but this heartfelt tribute to a great friend appears also to refer to a period where Jaeger helped the composer out of a depression and to a particular long evening walk discussing Beethoven together. The depth of feeling in this variation has seen it come to represent numerous facets of England and it is regularly played at occasions both festive and ceremonial. Dora Penny. An entertaining and welcome youthful influence on the Elgars, her nickname Dorabella, taken from Mozart’s Così fan tutte. Her minor stammer is hinted at in the woodwind. Variation 11 (Allegro di molto): G. R. S.
George Robertson Sinclair. Organist of Hereford Cathedral. Aside from Elgar himself, Sinclair is the only professional musician to receive a variation. The music’s rushes, flurries and chordal flourishes might suggest the organist at work, but Elgar preferred to relate it to an event in which the Sinclair’s bulldog, Dan, fell down into the River Wye and scuttled around before scurrying back up to dry land. Variation 12 (Andante): B. G. N.
Another Enigma. The clarinet quoting Mendelssohn’s overture, Calm Sea and Prosperous Voyage, and the timpani often thought to evoke the sound of a ship’s engines have generally brought two names to mind. The first is Lady Mary Lygon, who was set to sail for Australia shortly after the work was completed, and whose initials appear in sketches of the ‘Enigma’ Variations. The other main candidate is Helen Weaver, to whom Elgar was engaged, but who set sail for New Zealand in 1885, and there died. Variation 14 (Finale: Allegro): E. D. U. The composer. EDU was a pet name often used in the diaries of Alice Elgar for her husband. This is an almost heroic self-portrait in what could be thought of as in a similar manner to Richard Strauss’s Ein Heldenleben. But Strauss’s tone poem and Elgar’s variations were first performed a mere three months apart. There is a certain defiance in the music and according to the composer, it was written ‘at a time when friends were dubious and generally discouraging as to the composer’s future’. But, in a more positive vein, he added, ‘this variation is merely to show what E.D.U. intended to do’. The enigma I will not explain—its ‘dark saying’ must be left unguessed, and I warn you that the apparent connection between the Variations and the Theme is often of the slightest texture; further, through and over the whole set another and larger theme ‘goes’, but is not played … So the principal Theme never appears, even as in some late dramas … the chief character is never on stage. Early suggestions as to the ‘larger’ theme and its ‘dark saying’ led more than one of Elgar’s acquaintances to suggest Auld Lang Syne as an appropriate valedictory or musical conceit. The search for suitably romantic, psychological, literary and musical ‘themes’ continues to this day. Most common has been the holy grail of finding a tune that acts as a counterpoint or otherwise locks into the ‘Enigma theme’. Candidates range from works by Mozart and Beethoven to Auld Lang Syne, through God Save the Queen, Home Sweet Home, (and even Pop goes the Weasel!) to the more recent revelation that the popular hymn Now the Day is Over fits the ‘Enigma’ theme like a glove. No doubt such solutions will keep coming, and Elgar’s enigma, whether truly a ‘dark saying’ or just ‘high jinks’, will continue to provide happy hunting for amateur and professional musical sleuths alike. By the time Elgar came to write his Concert Overture—In the South (Alassio), he was already a composer of real note, having risen to national prominence with the ‘Enigma’ Variations. The Dream of Gerontius was making inroads, the first of his honorary doctorates had been conferred and his Coronation Ode for Edward VII’s accession to the throne yielded another English classic in Land of Hope and Glory. The unheard-of honour of a three-day festival of Elgar’s music had been planned for 14–16 March 1904, at the Royal Opera House, Covent Garden, for which many had hoped for a first symphony. Instead, Elgar produced his longest symphonic movement to date. In the South was conceived in the wake of the triumph of The Apostles, while the Elgars were wintering in Italy in 1903 to 1904. The overture’s moods rather reflect those of the composer at the time—fluctuating from morose to excitable and stoic to playful. The history and pleasures of Italy play their part, and a Neapolitan song even puts in an appearance. There are also unmistakable strains of his beloved English countryside, where the work was completed. Elgar’s sketches for the overture’s first performance at the festival cite the ‘Joy of living (wine & macaroni) … the exhilarating out-of-doors feeling arising from the gloriously beautiful surroundings … in one direction & the blue Mediterranean in the other’. In the South was a huge hit at the Covent Garden Elgar festival, with the public and attendant royalty alike. The Serenade for Strings takes us back to some years before Elgar’s breakthrough ‘Enigma’ Variations and is not only one of Elgar’s earliest compositions to retain a place in the standard orchestral repertory, but also one of the most frequently performed of his orchestral works. The Serenade is a little jewel of a piece and the first of his compositions with which the composer was well satisfied. Indeed, later in life he professed it to be his own personal favourite of his works. Completed in 1892, its origins lie in a suite written around four years previously, the final score and piano duet arrangement both bearing inscriptions in honour of his beloved Alice. The piece was formally dedicated to the memory of the philosopher, W. H. Whinfield. The Serenade was first privately performed by the Worcester Ladies’ Orchestral Class, a group Elgar was involved in training, but had to wait a further three years for a first complete public performance, in Antwerp, 1896. Ever close to his heart, it was one of the final works Elgar recorded for the gramophone in 1933, the year before his death.